Isn’t it thrilling finishing your first marathon training plan…well any marathon plan?! Your marathon training plan gets a makeover! You become better adapted to go the distance, stronger, faster and proudly you move on to the next level and you are ready to begin training at an intermediate level! Yay! Time goals! Are You Ready for the Intermediate Marathon Plan? If you have run at least one marathon then you may be ready to up your training. Running a second or third marathon race might help you transition better into the more intense training but that is something that you need to decide for your body. Remember, there is no point rushing things and setting yourself up for injuries. 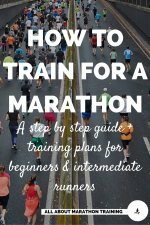 Also, I have a great resource for you if you are getting ready to start training for a marathon or if you are currently in training! 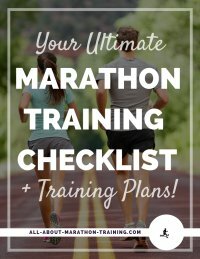 Get my FREE Ultimate Marathon Training Checklist Package a series of 5 checklists to simplify the process for every phase of your marathon training! How is this Marathon Training Plan Designed? Every 4 weeks is a “light week” which will hopefully give you a little break and rest your body. Every other week you will have either a tempo run or a interval workout . Speed workouts are always scheduled during weeks that you are not increasing your long run mileage (with the exception of weeks 2 and 4). Tempo runs are always scheduled during weeks in which you are increasing your long run. This is because the tempo runs are not (supposed to be) as strenuous as a speed workout. Both are necessary though to increase your speed duration. See here for more information and training techniques for the speed workouts . The guidelines on how fast to run your speed workouts are dependent on your goal time and are recommended at the bottom of this page (following the training program). Weeks 15 and 16 are “tapering weeks” that will reduce your mileage with the intent of being rested for your big marathon day! The focus of this program is to help you become faster while making your time goal. Compared to the beginner marathon training program , it does require more time and effort but put those in and you will be successful! It is well worth the effort and sense of accomplishment especially when your goal is fulfilled! I'd love to send you this FREE 16 Week Intermediate Training plan package! Just tell me where it should go! Send me my FREE 16 Week training plan! S = Speed Workout (S X 4 = A speed workout consisting of 4 miles, preferably four 1 mile intervals .) Your speed workouts (intervals) should be run at about 30 secs faster than your marathon goal pace. If you plan on running 8:30 minute miles throughout your marathon you should try and run your speed workouts at 8:00 min/mile.) Check out the Pace Chart for help discerning your pace per mile. 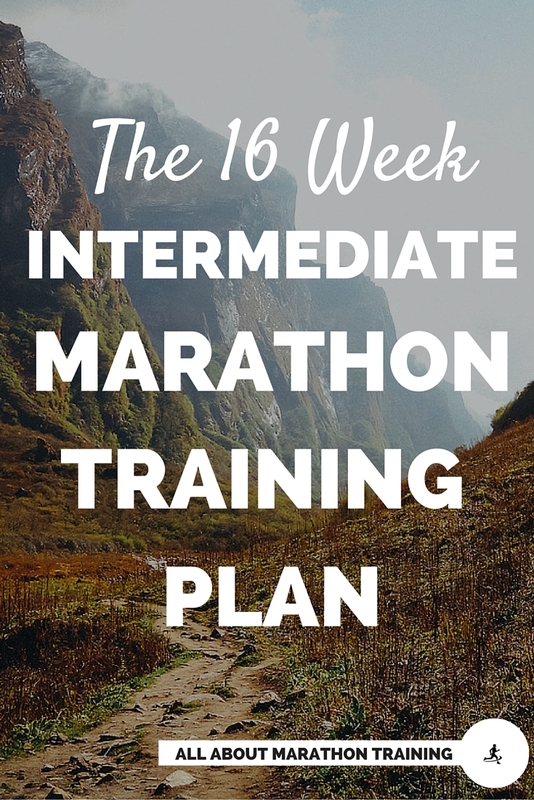 Don't forget to tell me where to send this FREE 16 Week Intermediate Marathon Training plan download! Are you trying to break a time goal? We have 7 Finishing Time Goal Training Plans to help you reach your next PR! The plans combine base running with a variety of quality runs that will help you gain strength and speed so that you can crush your time goals! 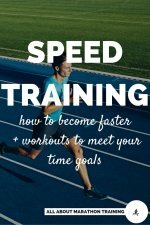 How to become faster with speed training!